Join us for the Stories of Truth 2.0 poetry night at DefSup. 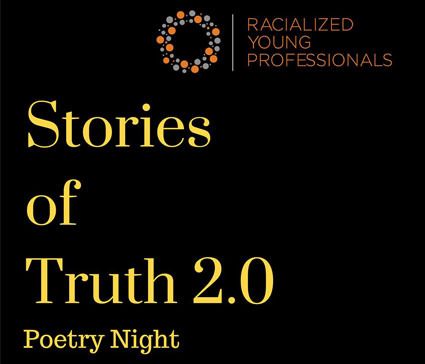 The event is hosted by the Racialized Young Professionals Network and features local poets Jana-Rae Yerxa, Ardelle Sagutcheway, and out of town guests Shadiya Aidid and Nasim Asgari. There will be an open mic to end the event. Tickets are $10, Paid in cash at the door or purchased through eventbrite. We are dedicated to making this event accessible. Please email us at info@rypnetwork.com for more info.